Over the weekend Senators Amy Klobuchar (D-MN) and Elizabeth Warren (D-MA) officially announced their bids for the White House in 2020. They join previously announced Senators Kamala Harris, Kirsten Gillibrand, and Tulsi Gabbard to comprise the largest pool of female candidates for president in history. And the election is still more than 20 months away. While women are making significant strides in the political arena, gender equity in the world of education remains elusive, even though it’s a field dominated by women. For starters, regardless of how you measure it, women in K-12 education earn 92 percent of what men earn for the same work. And even that isn’t the full story. As I demonstrated in a report last year, state teacher pension systems amplify gender-based salary inequities. It is alarming that gender-based pay gaps exist in spite of district-wide salary schedules that should, at least in theory, inoculate teaching from these kinds of inequities. Read the full report here to learn more about how women earn less retirement benefits. This entry was posted in Education Policy, Equity and tagged 2020, equity, teacher pay on February 13, 2019 by Max Marchitello. When Amazon CEO Jeff Bezos announced the new Bezos Day One Fund, a $2 billion investment in children and families, people noticed. Love it or hate it, everyone has strong feelings about Amazon, and Bezos is now turning his online sales-fueled largesse toward schools. Plenty of details remain to be worked out, but part of the investment will “launch and operate a network of high-quality, full-scholarship, Montessori-inspired preschools in underserved communities.” That’s good news. Research shows that high-quality preschool can lead to increases in children’s learning, particularly for historically underserved groups of children. If even 1 percent of the $2 billion investment goes to preschool, that’s more than Nevada, Missouri, Delaware, Alaska, and Hawaii combined spend on preschool. This entry was posted in Early Childhood Education and tagged Amazon, Day One Fund, Jeff Bezos, Montessori, preschool, teacher pay on November 5, 2018 by Ashley LiBetti. Today, April 10, may be Equal Pay Day, but teacher pay has been making headlines for weeks. We’re seeing massive, organized walkouts across the country as teachers stand up for increased education funding. But there’s more to the story: teacher pay is a gendered issue. If we want to truly examine teacher compensation, we can’t do so without acknowledging the demographic makeup of the nation’s educator workforce, 76 percent of which are women. Teaching is the most common occupation for women in this country, and not only are their earnings predictably lower than male teachers (8.7 percent lower, according to the Institute for Women’s Policy Research), but the field as a whole is compensated worse than other similarly educated professions. In fact, in the United States, teachers overall earn less than 60 percent of the wages of similarly educated peers. Even within the teacher workforce, we see disparities: in early childhood settings — which employ a higher percentage of women, especially women of color — teachers earn less than they do in high school roles. Finally, when speaking broadly about equal pay, women of color are particularly marginalized: research from the American Association of University Women reveals that black women must work until August 7 for their earnings to catch up to men’s earnings from the previous year, and Latinas until November 1. Edens spoke to me on the way to one of her side jobs at a children’s boutique — it was a Friday morning, a shift she wouldn’t typically work, except she was hoping to pick up some extra hours over spring break. When teachers like Edens and Godoy advocate for fair salaries, they’re arguably setting the stage for other predominantly female fields to follow suit. Can teacher walkouts pave the way toward progress for women in all sectors? This entry was posted in Education Policy, Equity, School Funding and tagged Annabeth Edens, Equal Pay Day, gender wage gap, Kentucky, racial wage gap, Teacher Compensation, teacher pay, teacher walkout, Vilma Godoy on April 10, 2018 by Kirsten Schmitz. Confused About Teacher Walkouts and Pensions? We’ve Got You. A few publications have provided context for what’s happening: EdWeek, the Washington Post, and Fortune have tackled the broad topic of teacher compensation with varying levels of detail. And my colleague Chad Aldeman weighed in on teacher pensions for an NPR panel on Tuesday, which you can listen to here. A version of this post also appears at our sister site, TeacherPensions.org. 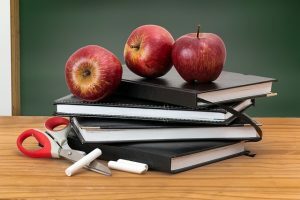 This entry was posted in Education Policy, State Education Policy, Teacher Pensions and tagged Social Security, teacher pay, Teacher Pensions, teacher retirement on April 5, 2018 by Kirsten Schmitz.